While we were in Trinidad, it was quite clear that Carnival was right around the corner. 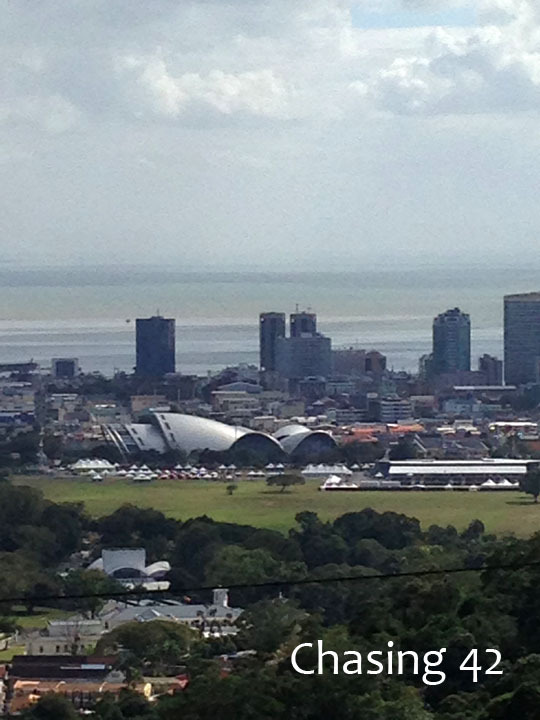 The steel pan drum competitions were in full swing as teams practiced for the finals, Soca artists were performing for free in the main square in Port of Spain, and every other radio announcement was advertising a Fete (think GIANT party with live music). Perhaps the most noticeable sign of the impending festivities was the plethora of activity on the Queens Park Savannah. 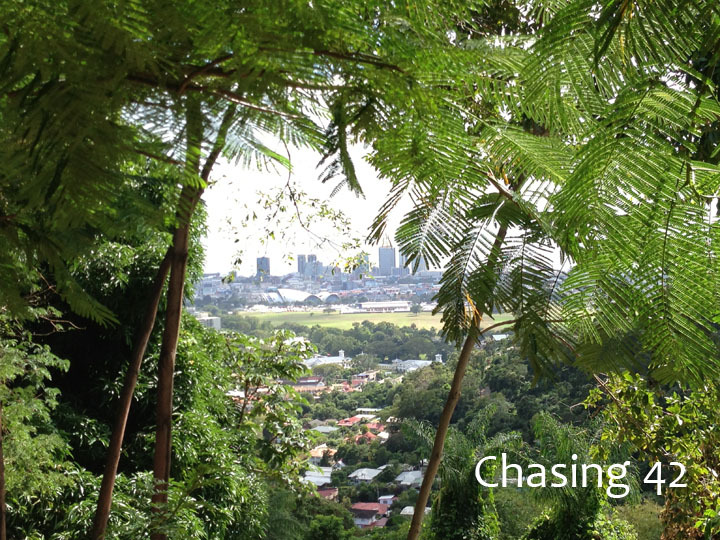 The Savannah is a large park and open-space located in Port of Spain. During Carnival, performances and vendors set up shop and it becomes party central. Vendor space is at a premium, and although it is supposedly a democratic selection process, it sounded like knowing someone in the Ministry of Tourism certainly didn’t hurt. All smiles before heading up the hill! Around the outside of the Savannah is a large walking/running path. The elaborate and revealing costumes of Carnival mean people love showing off their bodies, and subsequently become quite focused on making their bodies as attractive as possible. The fitness industry is huge in the months leading up to Carnival, but for those who don’t want to drop a nice chunk of change on equipment or classes, running around the Savannah works quite well. In the evening, once the sun has gone down, the paths get pretty darn crowded, as we learned during an evening stroll to work off a delicious dinner. Just off of the Savannah pathway is Lady Chancellor Hill. 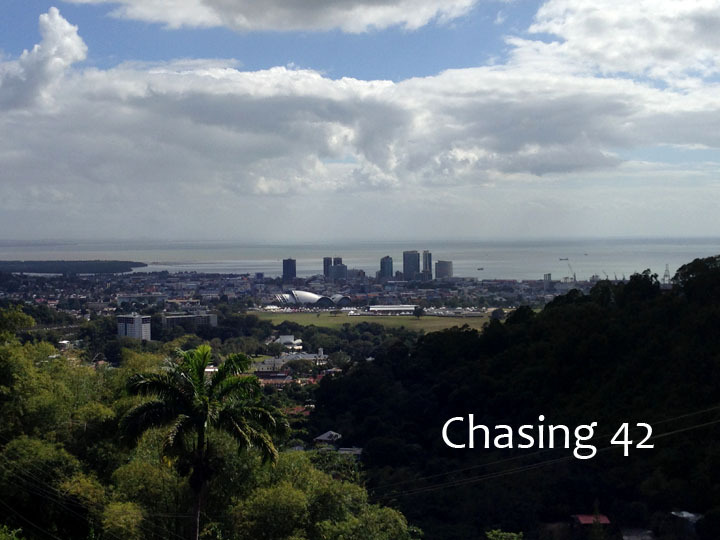 This 2.0 (I measured it at 2.2) mile hill ascends 700 feet to a lookout point that provides absolutely stunning views of Port of Spain and the Gulf of Paria. 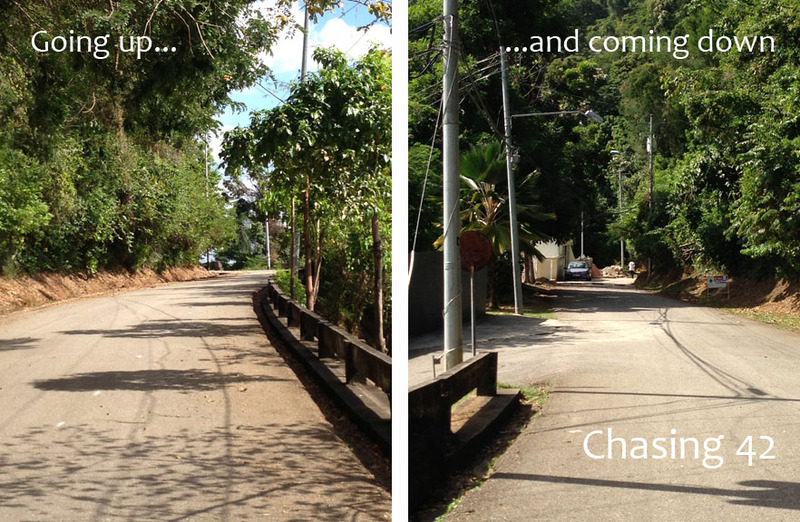 Whereas most of other roads in Trinidad & Tobago lack sidewalks and any room to run, Lady Chancellor Hill actually provides a bit of room to move out of the way when a car is heading straight for you. This is a good thing considering the high speeds and blind curves that seemed to characterize Trini drivers and their roads! 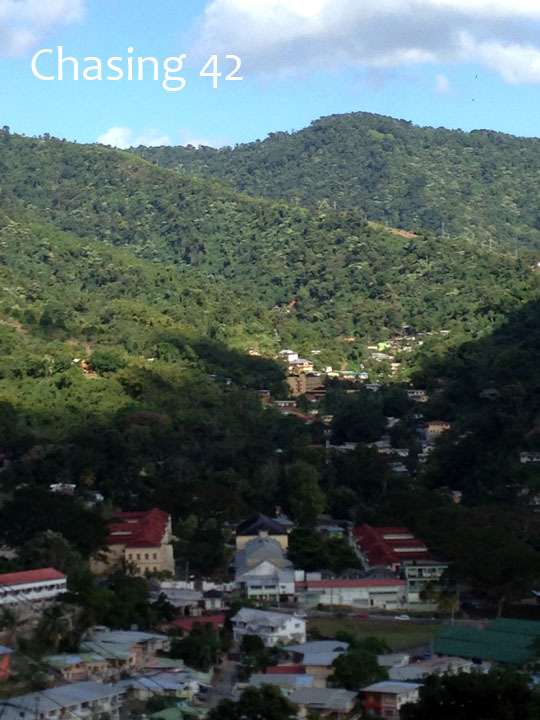 The hill is typically more quiet since it is a residential area, so it has become a focal point for Trinis looking to test their athletic ability or simply shed a few more pounds before Carnival. While on the way up, I saw a few other walkers/runners, but I basically had the hill to myself. The incline was definitely intense and it never really let up. At times, I felt like I was running up a treadmill that wasn’t going to give me any sort of break. As I ascended the hill, the views to the right became more and more breathtaking, although I wasn’t fully taking them in because I was extremely cautious of drivers and trying to actually maintain a running pace. However, when I reached the top, the view was everything I was hoping it would be and it made the killer run completely worth it. I’m sure I’ve commented before about how flat Iowa is and how I wished I had more choices for hill work. More than that though, I was just struck by the natural beauty of my surroundings. Perhaps Trinis eventually take the beauty for granted after living there for a certain amount of time, but I almost don’t know how that’s possible. There is just so much to stimulate the optic nerves and keep you engaged with your surroundings. Although the path was paved, I felt just as engaged in my surroundings as if I had been running a trail race. It was absolutely incredible! How can you compete with views like this? After some time at the top to take in the view, I began my descent. I knew it would be a whole lot easier going down than it was coming up, but I don’t think I was prepared for just what a difference it made. I would describe the run down as more of a controlled fall than anything else, and it felt great. I knew my quads would be screaming at the bottom, but I didn’t care. I was flying 🙂 I had averaged about 9:58/mile on the way up, and about 7:23/mile on the way down. That should tell you everything you need to know. When I reached the bottom, I continued around the Savannah, taking in the people, the traffic, and all the glorious sounds of a bustling urban environment. I passed by children in their school uniforms, food vendors getting ready for carnival, and folks out for an afternoon run/walk in preparation for the upcoming week. The loop took no time at all, in part because I was so enthralled by my surrounding. 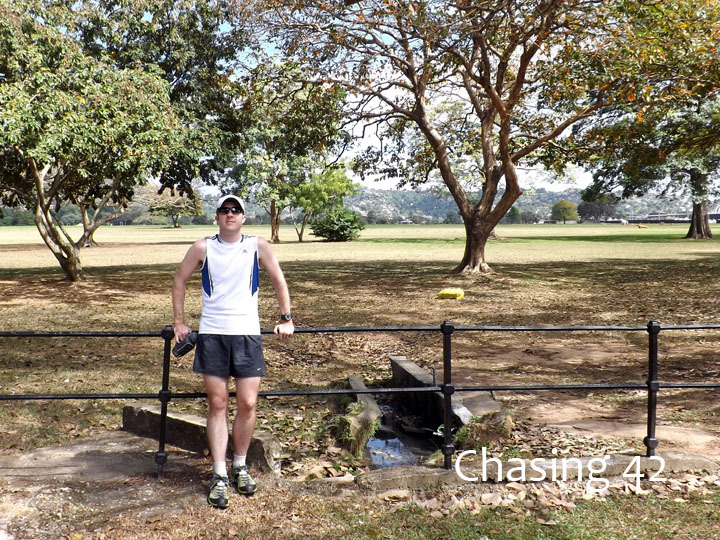 I simply didn’t want to stop running and I probably could have continued running around the Savannah for hours. Still smiles at the end! When I reached my starting point, the beautiful epicurean and our amazing friend turned tour guide were waiting to greet me. Now, if only I had a bottle of water or something refreshing to finish off my run. Oh wait, I just walked over to the nearest coconut vendor and bought a cold nut! He lopped off the top with his machete so I could drink the deliciously fresh water straight from the nut, and then he opened it up so I could eat the delicious coconut jelly and flesh hidden inside. Yes please! I’m pretty sure that if every run ended with fresh coconut water, I wouldn’t have a job because I’d be running all the time. Except then I couldn’t pay for the coconuts, so that would be awkward. Just sayin’. Young coconuts! Definitely a yummy treat and much cheaper/easier to obtain when you are running where the coconuts grow. I occasionally get them at the Asian supermarket. Your trip sounds great I’m glad you were able to get away! I am a reader/commmenter on your wife’s blog and cruised over here to say hi. I know you don’t usually listen to music when you are running, but if you want to try my sons’ iPhone app for running music, TrailMix, let me know and I can get you a copy. It detects your pace and seamlessly stretches your music to match it: no chipmunk effect. It chooses songs that are close to your pace so it doesn’t have to change them much. Their app has an average rating of 5 stars in the App Store. Thanks for the comment, Mary! I’d definitely be interested in trying out the app- I’m always looking for new tech apps to add to my bag of tricks. 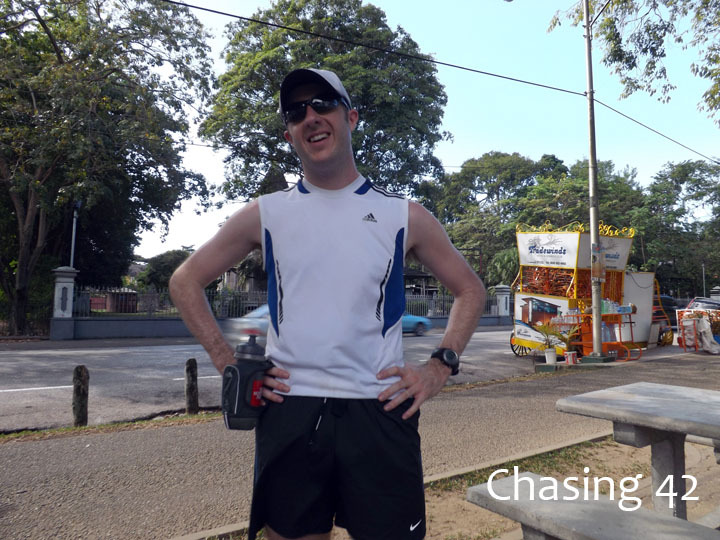 Feel free to email me at chasing42runner [at] gmail [dot] com. Thank you for your wonderful words. Lady Chancellor Hill really provides a breathtaking view. I only just started walking (1 month) up the hill for exercise and each time I get to the lookout, I revel in the beauty that makes up our island. You are most welcome! I’m quite jealous that you get to visit regularly…the beauty is indeed unquestionable:) I very much look forward to returning! I am sure you do. I felt your enjoyment in every word you wrote. Just found this while looking for images to show my friend in USA my workout spot……too funny re coconut water thanks for reminder to check out the view at top! It’ll b so pretty when the flowers r in bloom again after a long dry season. ..glad u enjoyed my little island.